I've decided to start a new series of blog entries, sharing my most beloved books with you. 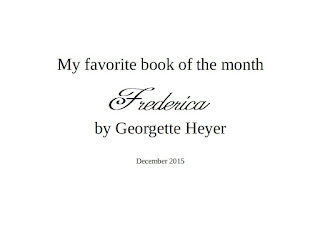 It wasn't difficult to find a book for this first blog about my newly chosen topic: Frederica by Goergette Heyer wins hands down whenever I'm asked about the books I most enjoy! Many of you will know Georgette Heyer for a writer of regency romances, and I'll readily admit that her romances are made of the usual elements that constitute a traditional romance – in general, some poor woman finds a rich man who's most suave and enigmatic. So what's special? Goergette Heyer has a certain something that makes every book by her a pure delight to read: It's her humor, the underlying irony, and her masterful description of characters. Take the first sentence of this book, for example. “Not more than five days after she had dispatched an urgent missive to her brother . . .” (he drives up to her house). That sentence already made me smile. It also shows in one masterly half-sentence that the sister is trying to push her brother around, and that he's having none of it. I'm intrigued and can't wait to read on. At this point, I was already hooked, chuckling to myself in delight. Heyer's sense of humor is wicked, and I often wonder how she looked at the people around her and how she must have seen through them and their antics to impress. 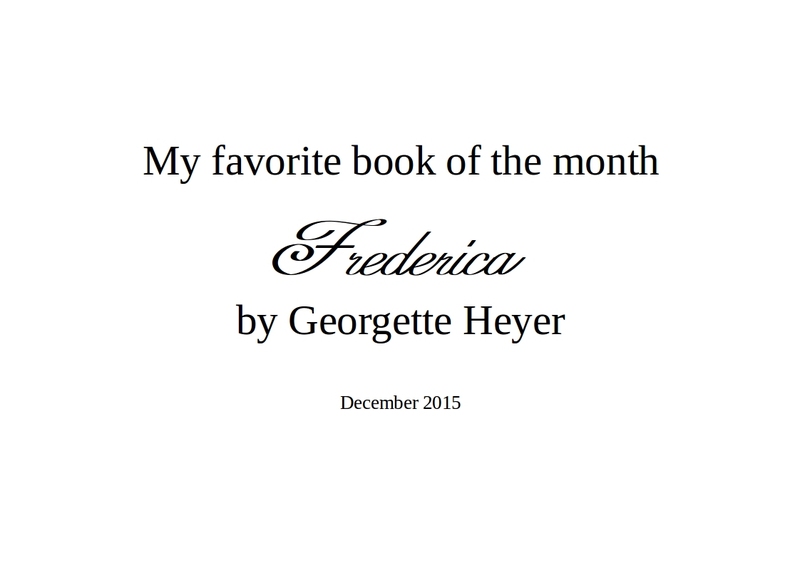 Frederica is a heart-warming and charming novel with amazing characters. Many people have reviewed the plot and the details over the years, so I won't go into that here. In fact, to me, it almost doesn't matter what Heyer writes about – it's the attention to detail, and the ironic notes in the sub-text that make me go back to her books time and again whenever I want something good and happy and fun to read – even if I already know most of what's happening. I wish there were more authors like her. If you know of any that you've found just as delightful, do let me know! bpost tracking also give a PMS shipment number to all of our organizations, with the objective bpost tracking international that customers can use the Parcel Monkey following gadget to screen the movement of packs.